Twins! Double the fun - for sure! I laughed so much during this session with Katie, Evan and their babies Foster and Charlotte. We photographed their milestone session in a field near the studio in Forest, Virginia. These sweet babies personalities are so different and if that’s not entertaining enough, each of them has the most adorable facial expressions that had me giggling nonstop! I couldn’t get enough of this sweet family and I really enjoyed our time together during their sunset session. I was so excited to welcome sweet Mackenzie back to the studio for her six month milestone session! I have had the pleasure of photographing her birth, Fresh48, and newborn sessions and I look forward to sharing her first birthday session with you all soon as well! I just need to say publicly: God knew what He was doing when He brought Mackenzie's mom, Kelly through the doors of my studio last year! We have become great friends and as I look back at 2017, it is easy to consider Kelly as one of my greatest gifts of the year. She has made me laugh, invited me into her life through some vulnerable heart-to-heart conversations, and even shared books, scripture, and other amazing resources with me. She is humble and kind and speaks the truth in love. It's not everyday a client becomes a friend, so that makes me even more grateful for who she has become in my life! Okay, I'll stop with all the mushy talk. :) Below are some of my favorite pictures of my short time with Mackenzie and her precious mama. Milestone sessions don't usually last much longer than 30 minutes because babies, well, they get over it quickly. :) So we move fast, changing clothes, snapping pictures, changing again, and making a lot of fun noises and silly faces! I hope you enjoy all of Mackenzie's adorable expressions! Do you have a little one at home you want to celebrate? Babies grow so fast, now really is the best time to capture them as they are! If you're looking for a baby or family photographer, I would love to work with you to create images you will cherish for a lifetime. Contact me and if you'd like, we can set up a no-obligation studio consultation to answer any questions you may have. We were crazy blessed to meet Kristy when we walked into Sunday's very first Pre-K classroom to meet her teacher and there she stood, ready to shake our hands and welcome us into her space. Little did we know at that time how important Mrs. Lunetta would become to our family! Kristy and her daughter Jessie have a uniquely bittersweet story. Their beloved husband and father passed away a few years ago and they live life missing him every day. I wanted to do something special for Kristy at the end of Sunday's first year in her classroom, to express our gratitude for her kindness and patience she showed towards Sunday and all of her classmates, but also to thank her for her beautiful display of what it looks like to walk alongside Jesus through hard seasons. Kristy is a beautiful example of a woman walking in the grace of God. 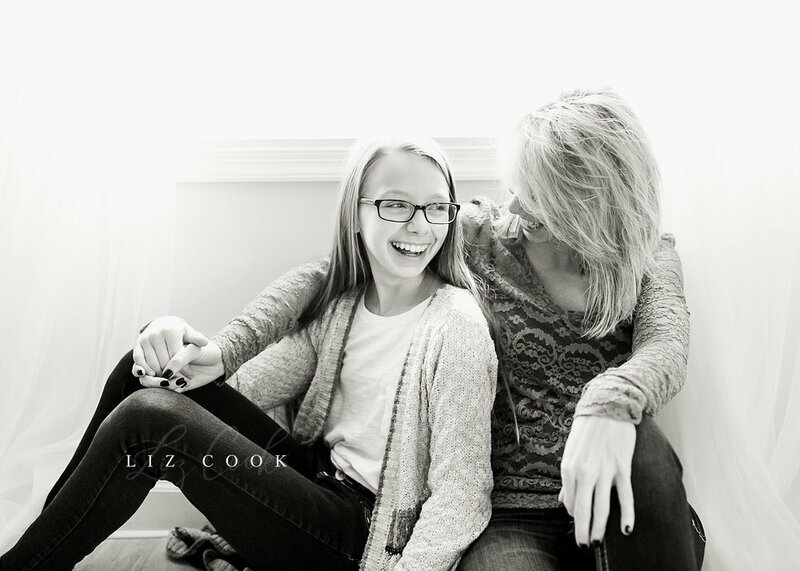 As she raises her beautiful daughter with love and kind discipline, I watch with admiration and hope I can be half the mom she is. Below are a few of my favorite pictures of our time together in the studio. For the last few minutes, we stepped out into the chilly air to snap a few pictures by their request. The sun glare in the background made me think their husband and dad was looking down on them and smiling as they snuggled up and their beaming smiles while wrapped in each other's arms gave me no doubt those pictures were meant to be taken in that moment, in that place, on that very day. What a magical bond they share. Thank you for allowing me to capture it, Kristy. It was my honor.